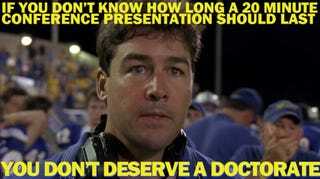 I found this and then found a tumblr of Coach Taylor Academic Memes. This one I love because I only did a MA program but it never ceased to amaze me when professor said 5 minute presentation and people would go on reading ppt for a half hour. I actually had a professor stop presentations half way through and ask if people understood the idea of 5 minutes and the fact that if you know and understand your topic you should be able to summarize it in 5 minutes. The same professor had to ask if people understood how to use ppt. "I can read. Don't read me a paragraph that you put on a slide." ppt and lengthy verbose presentations are a pet peeve of mine.